Oh boy. I’m about to take on the most disorganized, embarrassing, clutter-filled space in our house. Our master closet has become my nemesis, sucking the life out of me every time I walk though. I’ve got some beautifully organized spaces in our home, and a pretty good knack for coming up with organizing solutions that are sustainable for the long-term. The problem is that before I’ve dedicated time to creating a functional space, I’m a disaster! 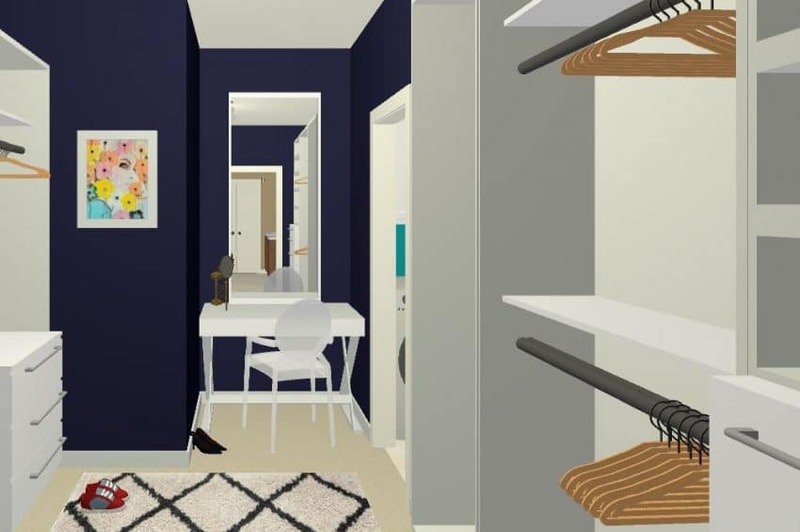 When I found out about the One Room Challenge, it gave me the perfect opportunity to work through my most problematic spaces one by one, on a deadline. Twice a year Linda from Calling it Home hosts the event, and 100+ bloggers and designers tackle rooms over 5 weeks. You can read more about my prior spaces in yesterday’s post. There is also an introduction to my sponsor, HomeRight, AND a giveaway you need to enter! So go do that, and then meet me back here. Okay? Everyone back? Let’s rip the band-aid off and check out my disaster. The master closet is also a walkway. It connects our master bathroom to the laundry room (which makes putting away laundry so much easier!). You can see how it flows in the floor plan. In addition to making the space prettier, we have a few functional issues that need to be solved. The lighting isn’t bright enough and has been making us crazy. After some quotes for adding recessed lighting equalled 90% of my entire closet budget, I had to pivot and come up with a new solution. I THINK I’ve got one and will let you know how it goes in week #2! 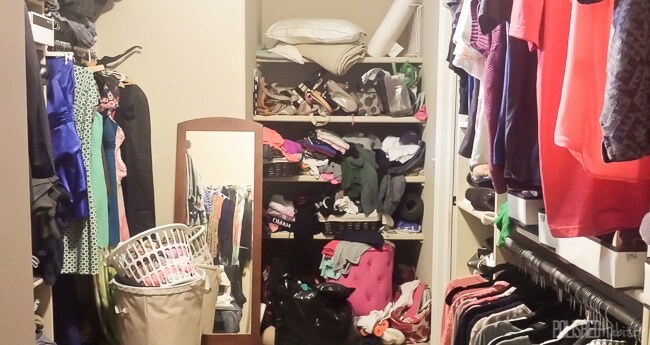 Because the closet is on one side of the bathroom, and the bedroom is on the other, we seriously NEVER use the dresser in the bedroom. 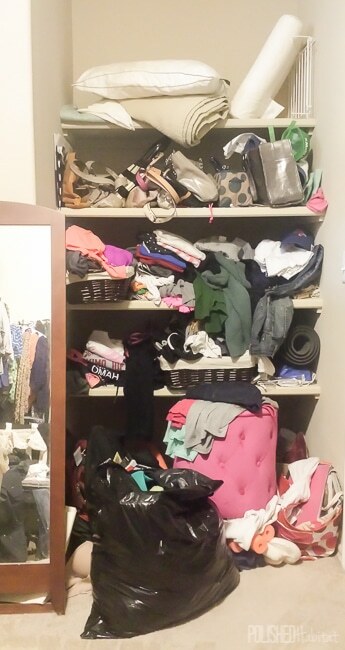 EVERYTHING is in the closet from normal clothes and undergarments to PJs and swimwear. We need drawers to keep the space tidy. Some of the current shoe shelves are too far apart AND I might have too many shoes, which means shoes end up piled on top of each other on every shelf. Not cool. Outside of the lighting, the biggest issue in the closet has always been the shelves in the recessed area next to the laundry room door. They are too deep and tall, so we end up with things hidden and there are piles on piles on piles. On piles. Ugh. At one point, there were at least some organized baskets involved, but once I decided we were gutting the closet, all hell broke loose. And I decided the closet was getting done way back in February. So yeah, 8 months of chaos results in a big mess. Thankfully, there isn’t a pile of ACTUAL trash in the room, it’s a donation bag. I couldn’t wait to get started! My new plan for the space makes me pretty happy. All those problem shelves are going, and the nook is turning into a vanity area. And you probably noticed the walls are getting some navy love. Because that’s what any logical girl struggling with not enough lighting would do, right? Here’s a farther out view. And the plan. So. Much. Better. This is the current view looking in from the laundry room. We have a high skinny window, but the light is blocked by a shelf directly below it. It took MANY iterations to come up with the perfect design to let the light shine, but I think I’ve got it. Directly under the window will be some amazing DIY acrylic small purse/clutch racks, and under that I’ll have storage for larger purses. More organizing magic will be happening, but I can’t give away all my secrets now. This is just the rough plan. On the other large wall, everything is getting ripped out as well. This side used to be completely jammed full, but I’ve managed to do a pretty good job moving things to the donate pile. I had to get a head start so I could sell my old wood hangers at a garage sale. My clothes are now all on these velvet hangers (affiliate link) from Amazon and I love them. Nothing falls off! Plus they take up way less space. I should have bought them years ago. More drawers, more shelves, more hanging space, more happiness. As you could see, navy and white are the primary colors happening this round. Satin brass, shiny chrome and acrylic are also going to have supporting roles. Because the actual clothes coming back into the space are a variety of colors, I wanted the room to stay neutral so it didn’t turn into a circus tent. I’ve also considered changing out our entire wardrobe to better match the space, but I’ve got 99 budget problems and a new wardrobe ain’t happenin’. I had to go with a different desk for the vanity because the dreamy beauty from my mood board is out of stock, seemingly everywhere in the country, until December. I almost cried. But the new option still has chrometastic legs, and saved me some money, so it’s not a total loss. Whew! I can’t believe we actually get to start demo now. You know, after we finish weeding through all the clothes and moving everything upstairs to the guest closet for the next five weeks. Anyone want to come help with that? Bueller? Anyone? 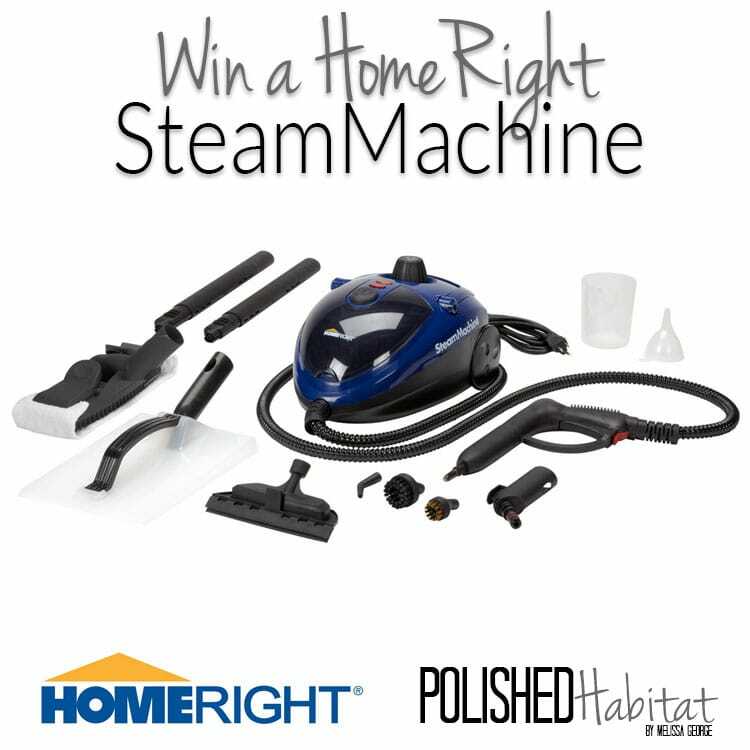 Don’t forget to hop over to yesterday’s post to enter the HomeRight SteamMachine giveaway – everyone needs one of these magic machines! Mine most recently saved me when I thought I was going to have to iron my 118″ curtains. Anything that gets me out of ironing AND helps me clean is a must have product around here. Have you seen my first ORC reveal from Fall 2014? And what about Spring 2015? Sounds like you’ve got a space ready for the spring round then! So when you are done will you come over and do my closet?! That is going to be fantastic, Melissa! I’m excited to follow along and see how it turns out. Heck yeah, that sounds like fun!!! Thank you Lindi! 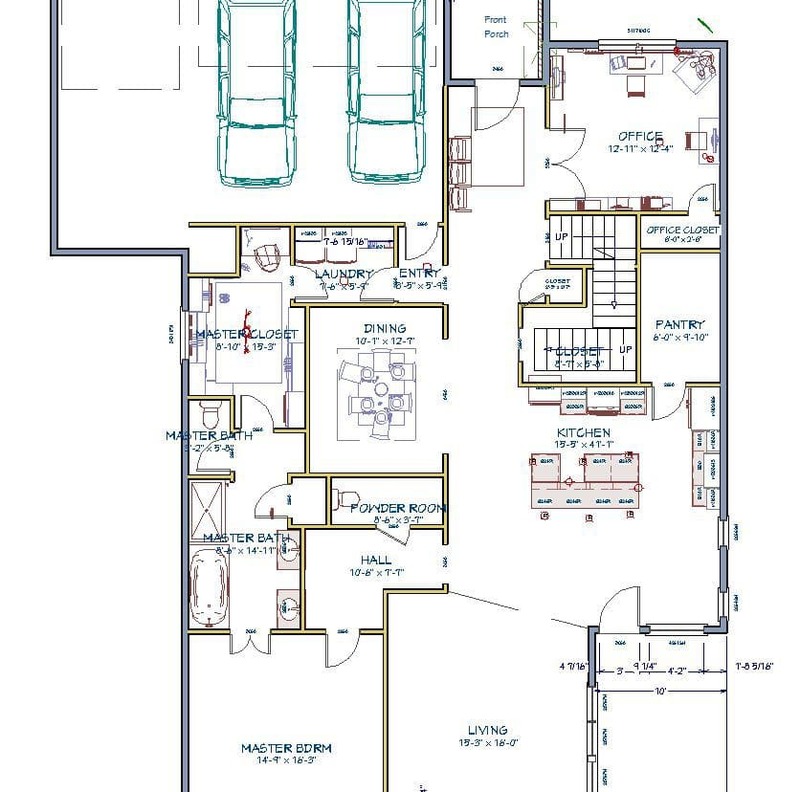 I’m obsessed with having an abundance of closet space, so when we found this floor plan, we knew it was the one for us. So excited to transform the closet into the gem it should be! Oh my, you are good at these challenges. Um, so you pretty much have my dream floor plan in your house. I LOVE IT! And that closet?! Wow! A nightmare now, but it is going to be incredible. I can’t wait to follow along on this journey with you, Melissa! Melissa – I love it! Your plan looks incredible and btw those 3D renderings are amazing. I’ll have to check out Chief Architect. 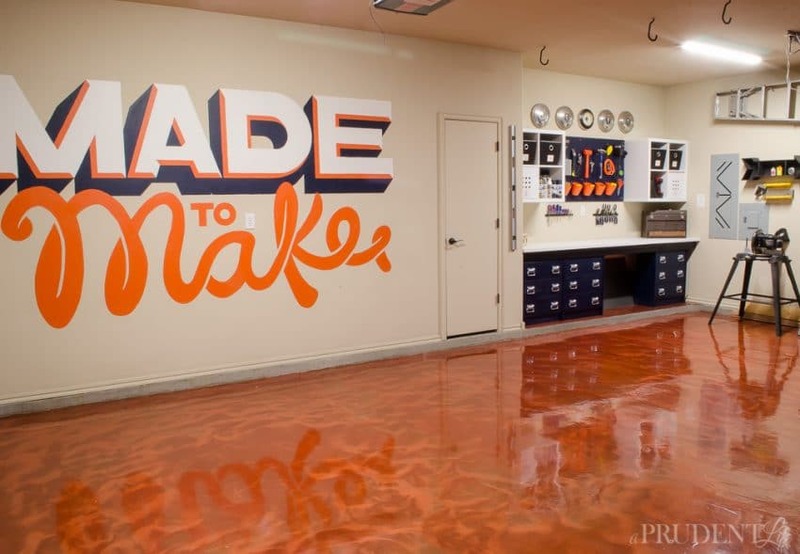 You’re inspiring me to tackle my disaster of a closet next…but first, I hope my garage turns our as well as yours did! So sweet of you! I’m totally jealous of the SMEG and imagine the coolest garage happy hours in your future! This is awesome Melissa! I could get dressed, do my make up and sleep in that closet and be completely content! Love the 3D designs! And don’t forget it’s also got a chair for happy hour 🙂 Thanks so much Tiffany! This looks really good – I love the space plan drawings!! I am trying hard to get a blog going, so I can share some fun projects I have been working on, but GOOD GRIEF, it is a lot of work to blog!! I don’t know when all of you fabulous people have time to CREATE all of this gorgeousness?!!!? Your plan looks great, can’t wait to follow along on your progress! Do you mind if I ask what program you use to create the space plan mock ups? those are SO COOL! Maybe I can get it together and play along in the next ORC… this looks like a blast and what a great motivator!!! Thank you Julie! Isn’t it insane how much work goes on behind the scenes? But you just have to jump in and embrace imperfection because it’s a continuous learning and improving process. I used Home Designer Suite by Chief Architect, and I love it. There is a learning curve, so honestly I wouldn’t really recommend it until you were comfortable with the rest of your blog. You can make a super fun mood board in OlioBoard for free and still have a really cool plan for your One Room Challenge – get planning now for the spring round! You can do it! Thank you for posting your mess, I think we all just let out a big sigh of relief that we aren’t the only ones hiding messes in our homes. 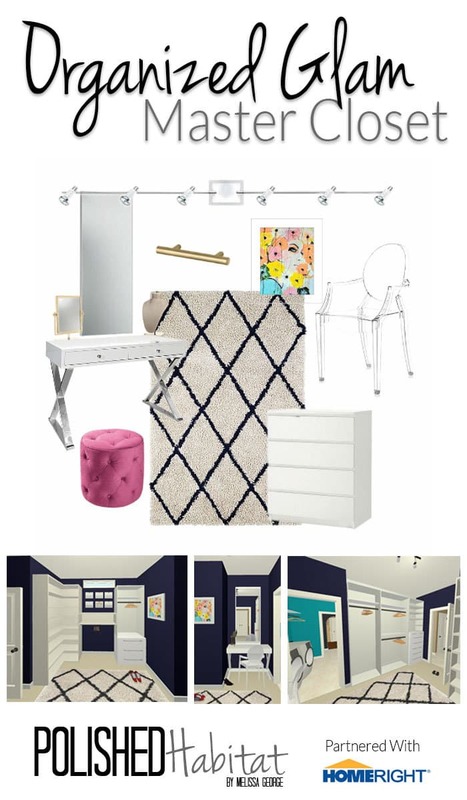 I love the mood board, the navy is a great color choice and the pops of color with gold, fabulous! PS I have those velvet hangers too and they are amazing! Yeah! I’m so glad the mess photos were helpful! It’s REALLY hard not to do at least some cleaning before taking photos like that, but I’m pretty stubborn about maintaining authenticity. And I do like showing people that I’m not a naturally neat person, so that others like me see that they really can get organized and have beautiful spaces. 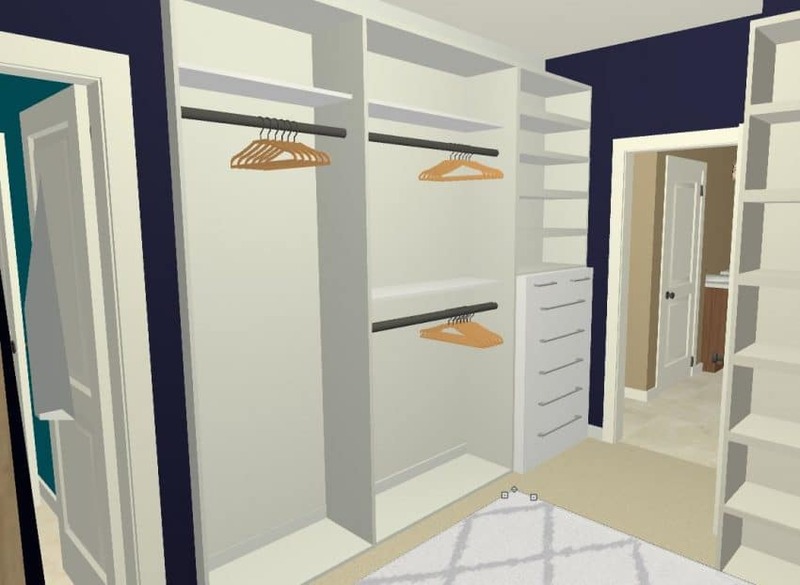 I’m pretty sure I could live in your closet…the after, that is:) It looks like such a luxurious plan! 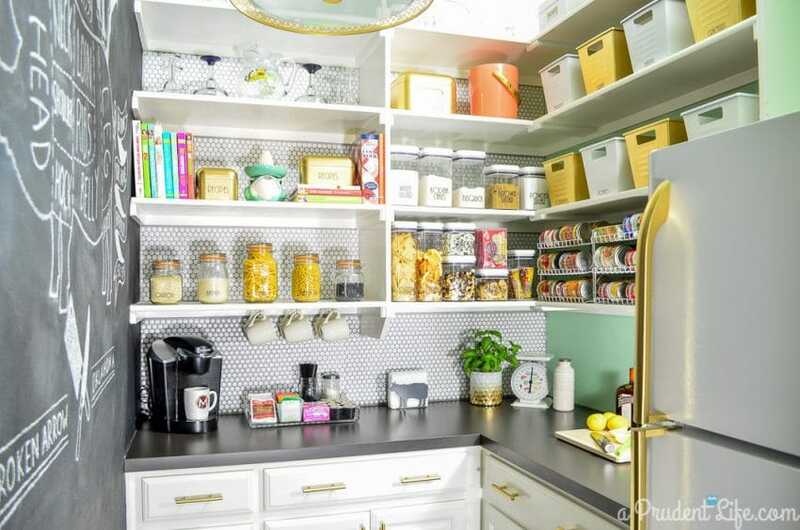 BTW, your pantry is still my all time favorite!! Thank you Teresa!!! I’ve been obsessed with lux closets FOREVER and can’t believe I get to make that dream happen. There will be some serious budget compromises, but I’m doing my best to hang onto enough of the glam that it is still extra dreamy on top of being an organized dream. I hope that’s true! I definetely believe that clutter attacts clutter (physical and mental). The more organized and neat the house is, the more focused and disciplined I am with everything else. This closet has been the last frequently used space that is such a mess, so I’m hoping it really does have a positive impact! And thank you for your sweet encouragement!!! I love your plan! 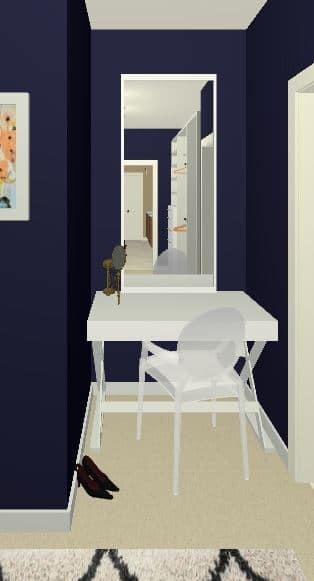 It’s going to be so nice to have a vanity in there too. Excited to follow along! Closet makeovers are so much fun! Can’t wait to see how it turns out! this is going to be top drawer (no pun intended) seriously though, can’t wait for this transformation…..beautiful plans! 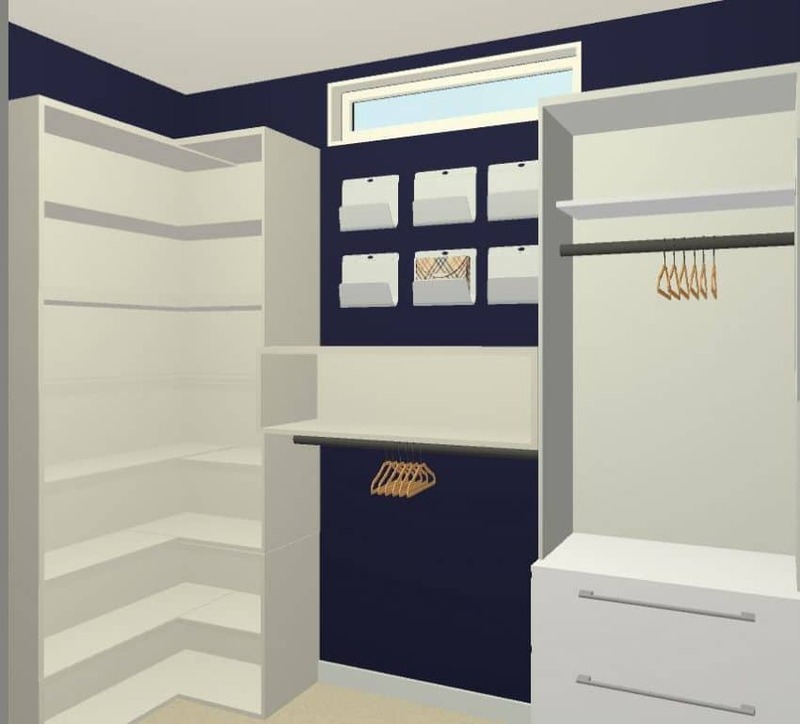 oooooh, I love closet makeovers…A beautiful walk-in-closet is like a grown woman playhouse. I am so excited for you and I love how you provided us with a blueprint! 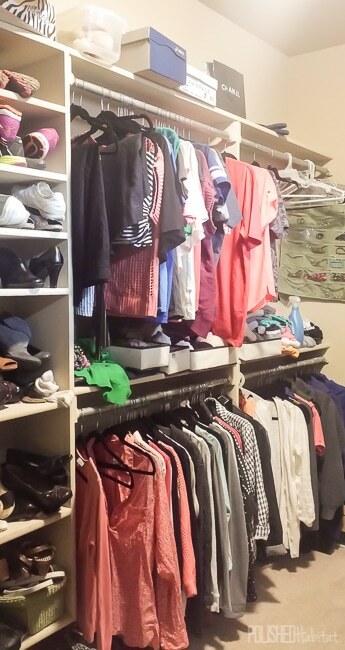 How functional is it to have the laundry room right off of your closet….Cool! Oh! I totally agree with your grown woman playhouse analogy! We LOVE the laundry room off the closet, we had seen it in a different model years ago and thought it was so brilliant! This is a huge undertaking, good luck Melissa. I know it will be great. I am so excited to see your closet. Mine is a small walk-in 🙁 so I’m excited to how it turns out, which I’m pretty sure…it will beautifully. Thank you Nicole, we are definitely spoiled by the size of our closet, even though it’s a little awkwardly shaped. Thank you Oklahoma cheap real estate. ? I love your plan! And I am certain the results will be gorgeous. Navy is my jam. I’m sitting this ORC out, but I am so excited to follow along with everyone! Good luck, Melissa! Oh! We’ll miss you this round, but I bet it will be so fun to follow along without the stress of doing your own space! I am so behind in going through the links to see who is playing this time. I loved your two previous ORC makeovers, so I’m sure this one will be amazing too! 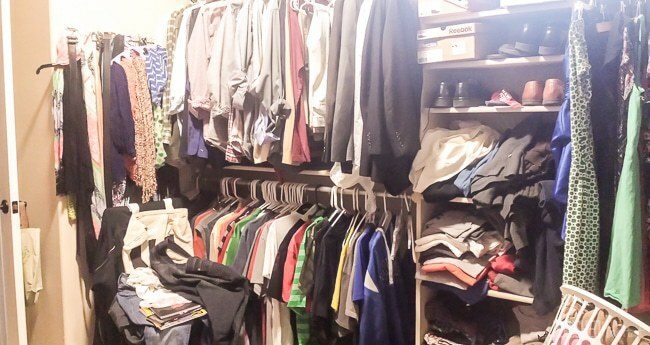 You are so lucky to have such a large closet. Mine is tiny and I am tackling it as part of my bedroom makeover as well. Thanks Vanessa! I think my brain would explode if I tried to do a bedroom and a closet all at once, but I can’t wait to watch yours come together! Thanks for all the instalove Stephanie! So frackin amazing! Your blog is such an inspiration. Maybe I missed it…but what was your budget for this room? I’m about to purchase my first home and your rooms are what I want mine to be when I grow up!